Previously, we saw how the first three days of creation pointed to three key events characteristic of the first three thousand years of human history - the fall of Man in the First Millennium resulting in sin and death entering the world, judgment in the Second Millennium in the form of a worldwide flood and a second chance through Noah and his ark, and God’s plan of salvation in the Third Millennium beginning with the Patriarchs - Abraham, ... See More Isaac and Jacob - and that was so vividly portrayed in the Exodus. Day 4 concerns the creation of specific lights - firstly, to separate day from night - symbolic of the separation of good from bad, holy from unholy; second, to serve as signs to mark sacred or appointed times - we learnt in our first session that these are God’s opportune times or Kairos when He will act in the Chronos of world history to bring about His will. The lights are to guide, indicate and draw our attention to these Kairos events; lastly, to give light - to illuminate or make clear not just what is good or holy or opportune, but ultimately to reveal God Himself to us in Jesus. To this end, we were told that God made two great lights - the greater light to govern the day and the lesser light to govern the night. In the original Creation Account, the greater light referred to the rising sun that marked the end of night and dawn of a new day, while the lesser light referred to the moon. Prophetically, the greater light refers to Jesus the risen Son of God who marks the end of the darkness and night of sin and death and the dawn of a new day in the light and life of God. 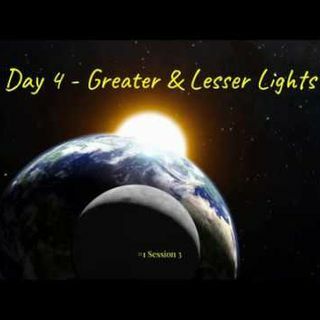 The lesser light - as we will see in Sessions Three and Four - refers to God’s chosen people and nation, Israel. It is not coincidental that the first act by Israel as a nation was to sanctify or set apart the new moon - we can read about this in Ex 12:1-2. Instead of using the sun or solar cycle/calendar to measure time, Israel was to use the moon or lunar cycle/calendar. Instead of starting the day at sunrise, they were to start the day at sundown (or you could call it moonrise). The lesser light also refers to the Church today. Now, there is a reason why God used the sun to refer to Jesus and the moon to refer to His people. For just as the moon does not have light in itself but reflects the light of the sun, both Israel and the Church are called by God to reflect His glory as ultimately revealed in Jesus so as to draw all nations to Him.